The concept of GPS shoes is nothing new, but this pair designed by Dominic Wilcox don't report your whereabouts to Mom, or an authoritarian government or something. Instead, they'll help you shuffle home if you get lost somehow. 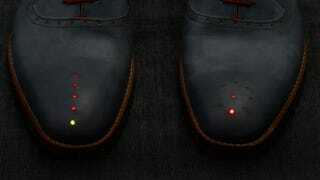 Commissioned by the Global Footprint project in Northamptonshire, these functional prototypes have a GPS device implanted in the heel with an antenna pointing out the back, and two sets of directional LEDs in the toes. The circular LED display points in the appropriate direction, and the straight one indicates distance. And how do you turn them on? You click your heels, duh.